It has been a whirlwind week. Peter got home late Sunday night after nine days in Florida for winter break (thank you Migliozzi family!). He swam in the ocean, fished, tasted fried alligator and had a blast at Busch Gardens on the roller coasters, including this crazy looper de looper, Montu. I’ve spent the past few days surfing the couch, as chemo number four was on Friday. More about that in a minute. But first the fun leading up to infusion. David left for a business trip on Tuesday morning. Realizing I would be alone the first night after chemotherapy and feeling kind of sorry for myself, I called Melinda, who immediately volunteered to come up for a sleepover. And then on Wednesday my sister Bink flew in for a short visit. We zipped over to yoga class only to discover that it had been cancelled due to inclement weather (it was kind of slippery out). No mind. We enjoyed a nice dinner out and then came home and watched the new James Bond movie, Skyfall. I miss the days when family was just around the corner! Thursday morning we were on the road for Boston by 6:30 am. Due to the fact that the pharmacy in the Yawkey building is being remodeled, infusion would be a two day affair. Day one was labwork and an appointment with Dr. Shaw. I had emailed her earlier about the fact that I have been experiencing both tinnitus and decreased hearing since the last infusion. Unfortunately, ototoxicity from platinum chemotherapy can potentially be irreversible, (again, I am at greater risk for side effects given my four prior infusions of cisplatin) and in addition my white blood cell count was depressed (leukopenia), so Dr. Shaw advised returning to a lower dose of carboplatin. That was fine with me. Bink and I had the rest of the day off, so Jemesii met us at MGH and we took a short ride on the T for a yummy lunch at Flour. 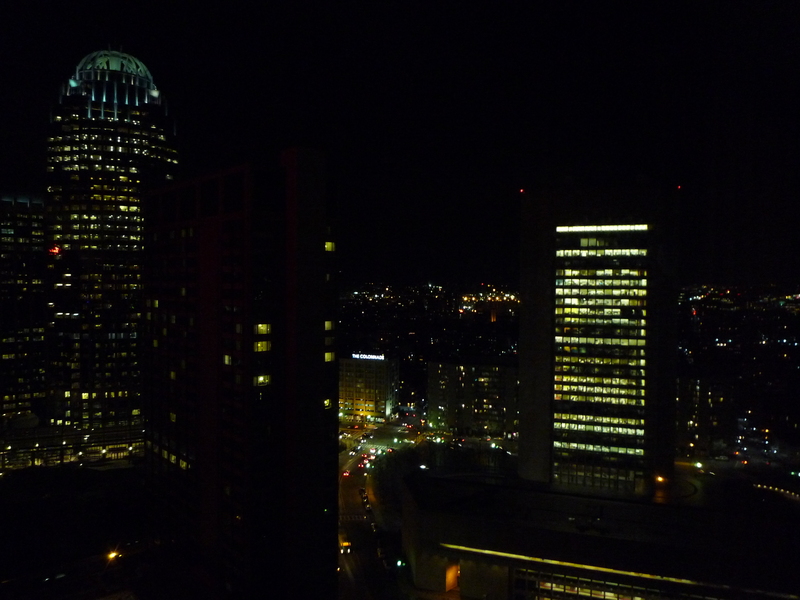 Then we picked up my car and headed over to the Hilton in Boston’s Back Bay. I mentioned in a previous post the largesse of a good friend who has donated some of his Hilton points so that I would not have to make the drive back and forth when appointments doubled up. This is the first time I had taken advantage of his generous offer, and the fact that Bink was along made it into a night out on the town. First though, an afternoon on Newbury Street, where we worked our way up the retail food chain (primarily window shopping). Last stop was the Barney’s in Copley Plaza, which for all intents and purposes may as well be a museum.We also enjoyed a meal in Legal Seafood, and after bidding adieu to Jemesii, retired gratefully to our room with the view on the top floor of the Hilton. The next morning Binky treated me to room service breakfast in bed (a first for me!) and then it was time to head back to the Yawkey Building for infusion. There was a wee bit of confusion as to whether or not I should have dosed prophylactically with antihistamines, so just to be on the safe side we delayed a bit while Bink ran to CVS for some Zyrtec. No more drama until the very end when the vein with the IV suddenly became quite red and painful—what the chemo nurse referred to as a ‘flare‘ reaction. Fortunately it settled down rather quickly after the IV was removed. Bink and I had a quick lunch from Whole Foods and then, all too soon, it was time to drop her at the airport in Manchester. I made one more stop—for prescriptions, three magazines, and two cans of tuna. I had just settled into my surfing position on the couch when Melinda showed up. Tuna sandwiches, lots of chatter and some fine companionship made the night fly by, and Melinda hung around until David got home at noon on Saturday. After that, I started to crash a bit—the fatigue this time around has been rather stunning. It seems to grab you around the shoulders and just pulls down hard; frankly, resistance seems futile. Plus, by Sunday afternoon it was clear that the virus I’d picked up from Peter earlier in the week had settled into my chest and was now an infection. I emailed Dr. Shaw and then thought better of it—perhaps this warranted a phone call. Thankfully, she picked up and a prescription for Azythromycin was called into the 24 hour pharmacy. Today I am feeling somewhat better—it will all be up from here.